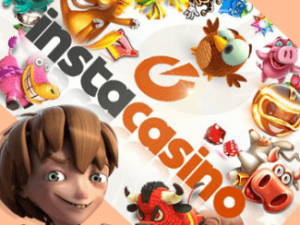 InstaCasino started in 2014. A team of individuals with extensive background in iGaming started the company. In fact, before launching the brand, the team did lots of planning and research. And in all honesty, their passion for the industry shows all over the site. Which means that you as a player will benefit from innovative marketing campaigns and friendly customer support. All and all, this brand focuses on creating a safe, user-friendly and fun place for all players to hang out. Additionally, know that this casino uses one of the most stable platform currently available on the market, GIG. Which means their site is reliable and they frequently launch new games too! General Concept: Straightforward navigation which focuses on the brand and great game filters. Game providers: NetEnt, Microgaming, Play’ n Go, QuickSpin, NYX Gaming, Scientific Games, IGT, Yggdrasil, Red Tiger, Genii, and Evolution. Special features: Real Spins, login bonus, reload bonus, and exclusive bonuses. Customer care availability: Opened daily between 07:00 and 23:00 GMT via chat and email. Payment methods accepted: Visa, MasterCard, Skrill, Neteller, Paysafecard, Zimpler, Bank Transfers, and Trustly. The exclusive UK welcome offer will match your first deposit up to £200. To claim this bonus, you need to deposit a minimum of £10. Additionally, you’ll receive 10 Real Spins after depositing. What’s more is that you can choose to play them on either Starburst or Twin Spin Deluxe. But that’s not all, know that the winnings from the Real Spins are completely wager free! To take note of, the welcome offer needs to be wagered 60x (bonus only) with a max bet of £5. Also, keep in mind that, the offer excludes players who deposit using Skrill and Neteller. Instead of giving you Free Spins, you receive Real Spins when you deposit. The Real Spins works like Free Spins except that they’re better since you don’t have to wager them. So, if you win big, you can withdraw immediately without having to fulfil any requirements. Even if InstaCasino doesn’t have a loyalty or VIP program as such. Know that loyal players always get more when they choose to keep on playing on this brand. In fact, the little extras come in the form of exclusive bonuses that you’ll see in your inbox once you’re logged in. Additionally, not only do they reward their most loyal players with bonuses, but know that they have exclusive promotions on certain games and deposit methods. So it’s always a good idea to check the promotion section before depositing. Because it could well be that they’re offering you added benefits to play your favourite games there. As a rule of thumb, always check the terms and conditions before claiming a bonus. Although, if you make a mistake the support is only one click away to help you. All in all, InstaCasino is user-friendly and ooze with freshness and excitement. Also know that the lobby has special filters to help your game navigation by provider, theme, feature, category, and extras. So, if you’re only interested in the big payout slot. They’re easy to find on InstaCasino, set the filter to High Volatility. Or, if you’re a jackpot hunter, use their filters to find the jackpot that is about to fall! Without a doubt, this casino is perfect if you’re tired of endless navigation to find your favourite game or provider! And, know that all these excellent filters are available on mobile casino too! Sign up to InstaCasino today and claim the exclusive welcome bonus negotiated by our team and have fun!